When I first found the recipe for Pope Ladies in the Recipe Box, I giggled at the name, then I read the description: 'traditional fare for New Year's Day,' and I couldn't stop giggling because obviously these were some kind of joke made up by Betty Crocker, right? Wrong. I know it's too late for you to make your own Pope Ladies for THIS New Year's Day, but since they are also traditionally served on Lady Day (March 25, the day Mary found out she was pregnant), I figured I'd give you a head start on all your Lady Day preparations. This is literally the diagram I had to follow along with the directions. For once i think mine came out better than the picture! An ok story, but it doesn't really do much to explain the name, which is why I prefer to believe the other story (though I'm quite sure Eleanor, a devout Catholic, would probably not). The second version of the story states that the rolls are named for Pope Joan, an apocryphal and (probably) mythical female pope born in 818AD. Although it's now thought that Joan was a myth, the legend said that she was only discovered to be a women when she stopped in the middle of a parade to give birth, and was shortly thereafter murdered because of it. This legend first gained traction in the 1200s, roughly the same time as Pope Ladies came about, so it's also thought they might have Joan to thank for their name. 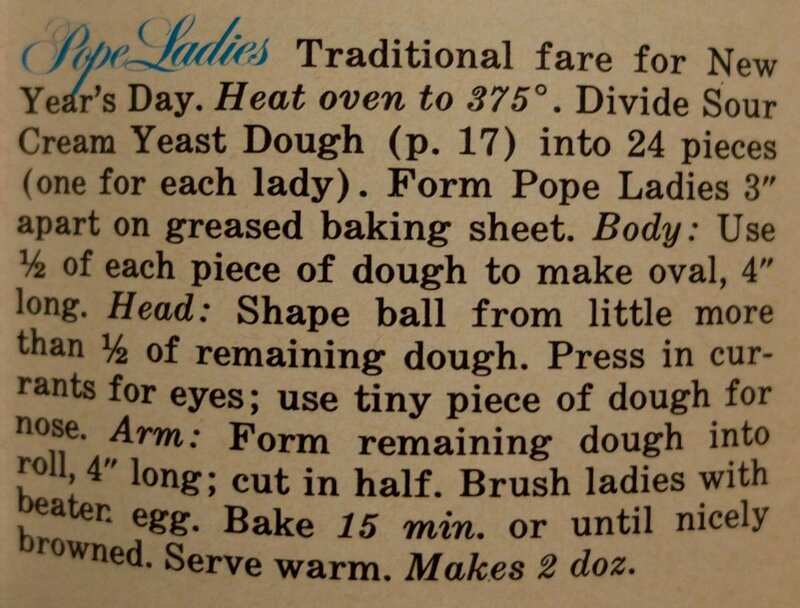 Either way, this particular batch of Pope Ladies is not quite made in the traditional manner- usually they would be made with scalded milk, not sour cream and usually they would have eyes made from currants and a tiny dough nose. But I was making these while drinking a prosecco cocktail last night shortly before heading out to a pub with Judson and friends and I completely forgot the faces until they were in the oven. Oops. These are best straight from the oven, when the outside is crusty and firm and the interior is soft and plush, but they reheat well and are pretty good at treating a hangover as well. The dough is forgiving and easy to work with, and if, for some reason, you have the willpower to make food in your kitchen today, I'd recommend you whip yourself up a batch of Pope Ladies and then call all your hungover friends to come eat them with you while you tell them stories about medieval feminist popes. If your friends are anything like mine, they... probably won't be too surprised. 4 spoons out of five. They're absolutely perfect when fresh from the oven, but not quite as good when reheated so I'm knocking off a spoon because they need to be eaten promptly. two years ago: happy new year! Dissolve yeast in water in mixing bowl, then set aside. Heat sour cream over very low heat just until it melts and is lukewarm. Add warm sour cream, butter, sugar, salt, ONLY ONE egg and 1 cup of flour to yeast mixture. Add remaining 2 cups of flour and mix until dough comes away from the sides of the bowl. Knead dough on a well-floured surface until smooth, about 10 minutes (alternatively, if you have a dough hook for your mixer, beat on very low speed for approximately 3 minutes). Grease the mixing bowl, put dough back into it and turn once so greased side is facing up. Cover tightly and put in a very warm place to rise 1 hour (or if you live in a drafty Scottish flat, up to overnight). Preheat oven to 190C/375F and grease 2 baking sheets. Form half of each piece into an oval-shaped body approximately 4 inches long, lay on baking sheet. Divide remaining piece of dough in half again and roll one piece into a long thin snake approximately 4 inches long. Lay this piece in a U-shape around one end of the 'body' to form arms. 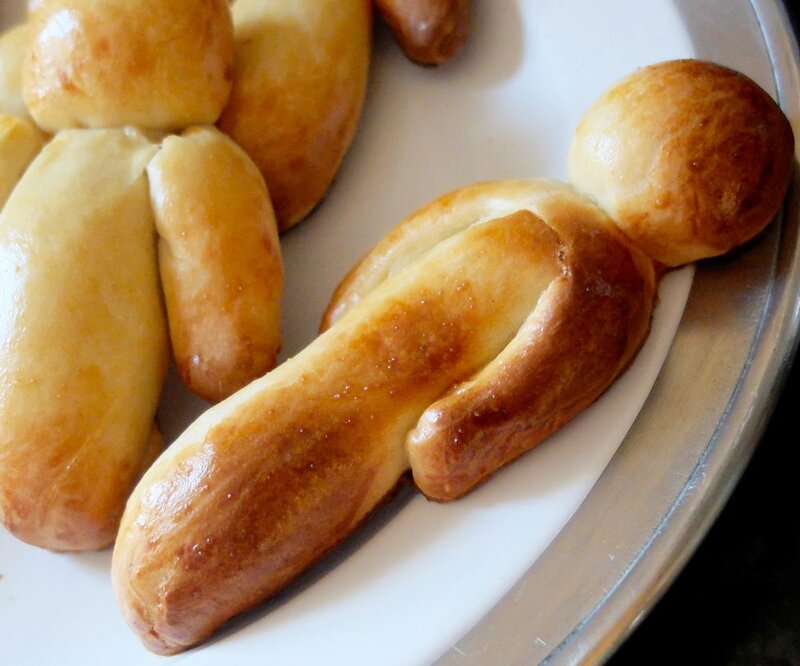 Take remaining piece of dough and form into a ball for the head. 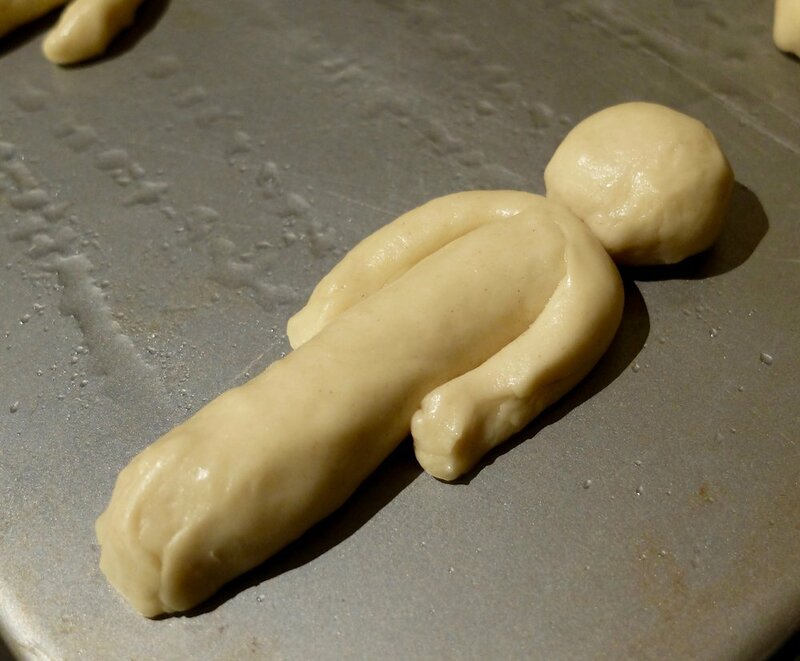 Place head ahove arms body on your baking sheet (they'll rise enough in the oven to attach as long as they are touching). 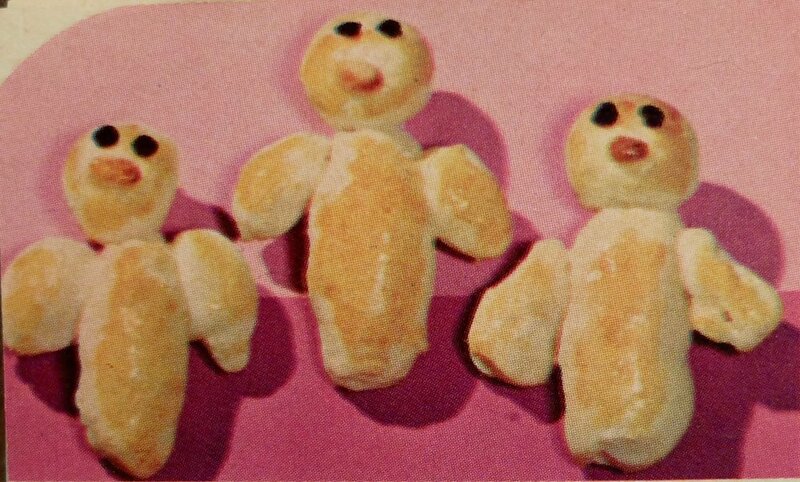 Repeat until you are out of dough, keeping Pope Ladies spaced apart at least 3 inches on your baking sheet. Beat remaining egg with a fork and brush over the ladies, taking care to avoid large drips. Bake 12-15 minutes until golden brown. Serve warm, best straight from the oven.